I Need Dental Implants in Washington, DC – What is the Cost? It’s been tough living without your teeth, and you desire to replace them. Dental implants in Washington, DC are the best option, but you want to know how much they will cost. Is it possible to get a quick quote over the phone or should you visit your local dentist for a consultation? Find out as you continue reading. Before exploring the cost of dental implants, let’s take a look at what they consist of and how the process works. The implant is surgically inserted under your gumline and fuses with your existing bone through a process called osseointegration. Using a titanium post to provide stability and durability, the dental implant method is the only form of restoration that replaces the roots. Thus, it provides the support that is needed to prevent bone loss. On average, dental implants cost between $3000 and $4500. Because the dental implant method is such a dynamic procedure, the only way to get an accurate representation of what your cost will be is to visit your dentist for a consultation. Because your dentist takes such a tedious approach to the process, there is a 95% success rate. Because the consultation process is so integral in determining what you need and the associated cost, it is impossible for your dentist to provide a quote over the phone. Instead, visiting your dentist for a consultation provides an opportunity to ask questions, learn more about the process and get an accurate price quote. 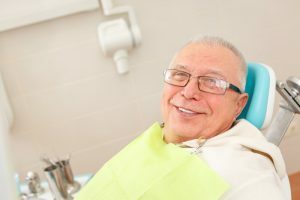 It’s important to be proactive about having your teeth replaced because the longer you wait, the more bone loss you can suffer, which then leads to facial collapse. If gravity takes over because there isn’t sufficient bone support available, then you’ll experience premature wrinkling from the lack of tension in your skin. The above problems can be avoided by taking the time to reach out to your dentist to schedule a consultation. You’ll then have the opportunity to be better informed so you can get on the road to smile perfection and restored function! Dr. Yelena Obholz earned her Doctor of Dental Surgery degree from New York University College of Dentistry. As part of her commitment to providing the best in care to her patients, she is currently enrolled in continuing education at the prestigious Las Vegas Institute for Advanced Dental Studies. Dr. Obholz uses her extensive knowledge and experience in periodontics, oral surgery and prosthodontics to replace patients’ teeth with dental implants at Aesthetic and Family Dentistry of Washington. She can be reached for more information through her website. Comments Off on I Need Dental Implants in Washington, DC – What is the Cost?